Our ever-popular Mark IV(pat) Ice Painter is a self-contained painting system that easily allows ONE person to paint an entire arena ice surface. The Mark IV will discharge its 100 gallon tank of paint in about 12 minutes dramatically reducing the overall time to complete the job. This innovative piece of equipment is also used for building ice from the initial bond coat to the finishing floods. The Mark IV is used in community, college, and NHL facilities from Juno Alaska to Taos New Mexico. Available in Self-propelled (our most popular) or Pull-type. A must for your arena! Do you have ongoing problems in the spring & fall with water DRIPS causing annoying and unsightly bumps on your ice? We manufacture the Ice Chopper that is an answer to your problems! This handy piece of equipment removes bumps quickly and easily leaving your ice surface clean and smooth. Regular use of the Ice Chopper will make ice breaking down to the concrete or sand a thing of the past! Do you suffer from a sore back following the use of a straight bar for chipping the kick strip after edging your ice? Our unique Ice Chipper is ergonomically designed complete with rubber coated handles. Our Ice Chippers come in 6" to 12" blades. Chipper blades are also sold separately with 6", 8", and 10" blades interchangable. 12" Chipper requires 12" blade only. Our Community Club purchased an Ice Chipper from I.C.E. and it is the best chipper I've ever used. It's light weight, gets in the corners nicely and no heavy pounding! Our old chipper (iron bar & blade) could not do the chipping and I would find myself out of breath feeling pain in my back. With I.C.E. 's chipper I chipped all the way around the board in less than 30 minutes, was not out of breath and no pain! I recommend this product and every Arena should own one for the sake of their employee's backs. Thank you for the Chipper! Our Ice Edger removes ice buildup along the side of your arena boards. The Edger cuts 0" to 1/2" depth and 12" width with convential depth adjustment. We also sell the full line of Olympia ice edgers in gas, propane or electric. Specificallty designed to remove puck marks from puck board, glass, supports, and painted surfaces. At last! A product that works!! Great for indoor and outdoor ice. Good for lighter snowfalls on driveways. Snow is removed quickly and easily. Permanent goal lights mount behind the net. Can be installed for wireless or hard wired. Typically hockey sticks are leaned against the wall or propped up in the corner. One person takes out their stick, and the rest start to fall creating a dangerous safety hazard. 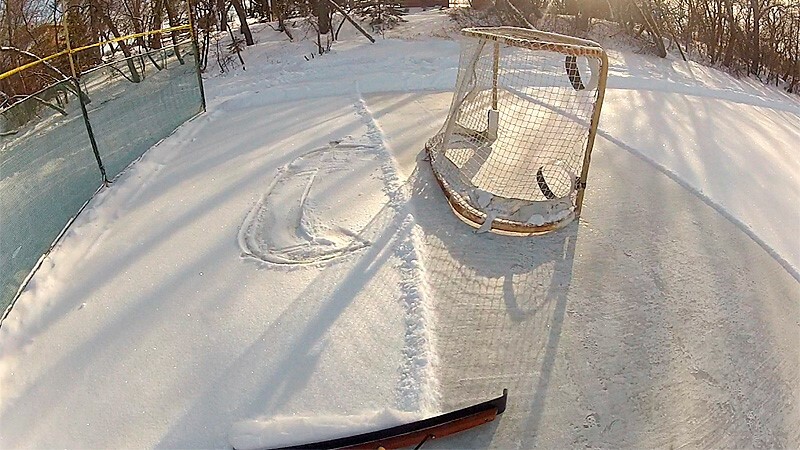 STICK CHECK is a system that allows for easy placement of hockey sticks but prevents them from falling over.